2 decks. Average. 1 redeal. 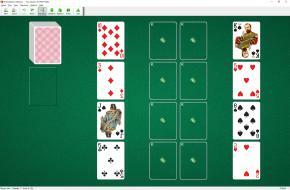 Twin Queens Solitaire uses 104 cards (2 decks). You have 8 tableau piles with one card per pile and 8 foundations. Kings are moved to the foundations as they become available. Pairs of Kings of the same suit are placed side by side. To build the foundations up in suit to Queens. 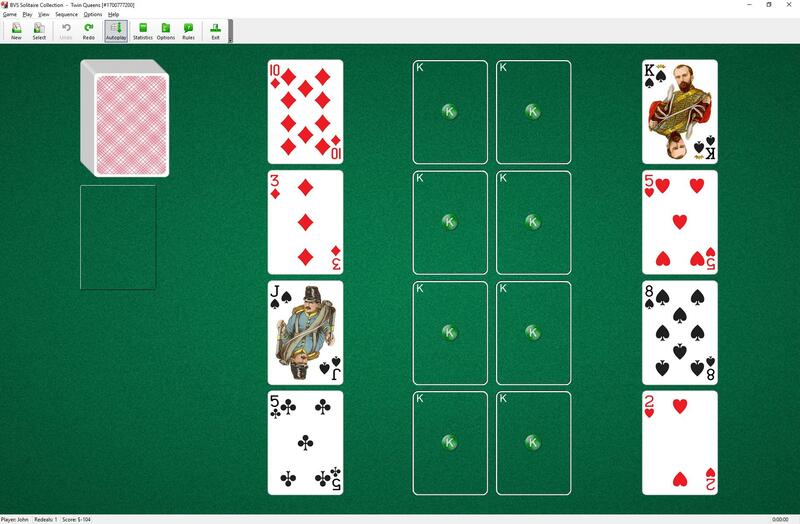 The top cards of tableau piles and the waste pile are available to play. You may build tableau piles down in sequence in suit. Only one card at a time can be moved from pile to pile. Spaces are automatically filled from the waste or stock piles. When you have made all the moves initially available, begin turning over cards from the stock pile to the waste pile. Twin Queens is a variation of Congress.